Once the homes of merchants, these three quirky, charmingly lopsided 17th-century canal houses, near Centraal Station, now welcome guests in recently refurbished though simple rooms. Request a canal-view room for the most charm or a room in the back for the quietest. Small rooms with spare furnishings feature black and white photo print wallpaper with scenery from Amsterdam – the Rijksmuseum here, the Skinny Bridge there – though it should be noted that this is practically a ubiquitous design feature in Amsterdam hotels these days. Rooms in front have a view of the Singel canal through large sash windows. There’s also free Wi-Fi throughout the hotel. Single travelers take note: Singel Hotel still offers single rooms, a rare feature in Amsterdam hotels these days. And some even offer canal views! Very small white-tiled bathrooms offer walk-in showers (some with shower curtains! ), modern sinks, wall-mounted toilets, proper hairdryers and only the most basic bathroom products (hand wash and “hair and body shampoo”). YOU SHOULD KNOW There’s not a lot of space to stow away any bathroom products here, so you might want to bring a toiletry bag that can hang from a hook. At the time of our visit, it looked dated and messy with travel brochures, but we were told the lobby and breakfast room are scheduled for a refurb in early 2018. A free buffet breakfast is offered in a room that is in desperate need of a refresh (we were told this was in the works when we visited). Yes, there is a small refreshment area, but you’d be better off exploring the many options in the area. 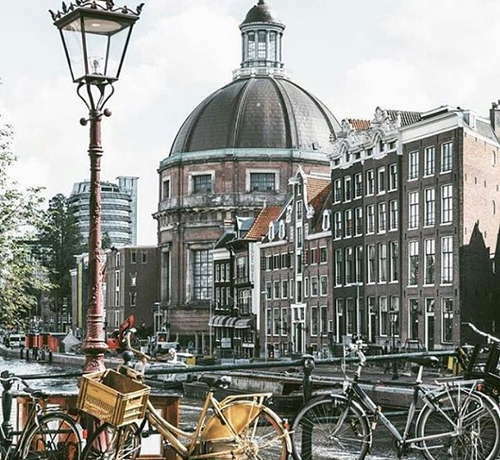 Located in the UNESCO World Heritage Site Canal Belt, just minutes’ walk from many of the major sights, this hotel offers good access to the old Center, Jordaan, and the Red Light District. And, there are plenty of public transport options and canal cruises available at nearby Centraal Station. Fix your morning woes with some of the city’s richest croissants, butteriest brioche and most perfect pain au chocolat at artisan French bakery Gebr. Niemeijer (3-minute walk). Or head to one of Amsterdam’s most romantic restaurants, De Belhamel (5-minute walk) for French-Italian fare in a Belle Epoque ambiance. If it’s comfort food you’re after, La Perla Pizzeria (12-minute walk), is famed for its authentic wood-burning oven Pizza Margherita, and convivial vibe. For some of the most creatively presented cocktails in town, head to craft cocktail bar Tales and spirits (3-minute walk). Café ‘t Smalle (11-minute walk) has been around since the 18th century when it was the Hoppe Distillery, and its canal-side terrace is one of the prettiest places to grab a casual beer. With its recently spruced-up rooms, Singel Hotel is a good budget option on the canals.